A huge fireball has engulfed a van in central London, with a thick plume of smoke rising and the petrol tank reportedly "exploding". More than 70 firefighters worked through the night to control a massive fire at an office block in west London. An underground electrical fire has forced the evacuation of more than two thousand office workers in central London and the closure of the Holborn tube station. Police have closed off Kingsway in both directions and motorists are being told to avoid the area. The London Fire Brigade says the alarm was raised when smoke was seen coming out of an access hole in the pavement. It says the fire is among power cables. A large safety cordon has been set up and nearby buildings have been evacuated because of the thick, black smoke. 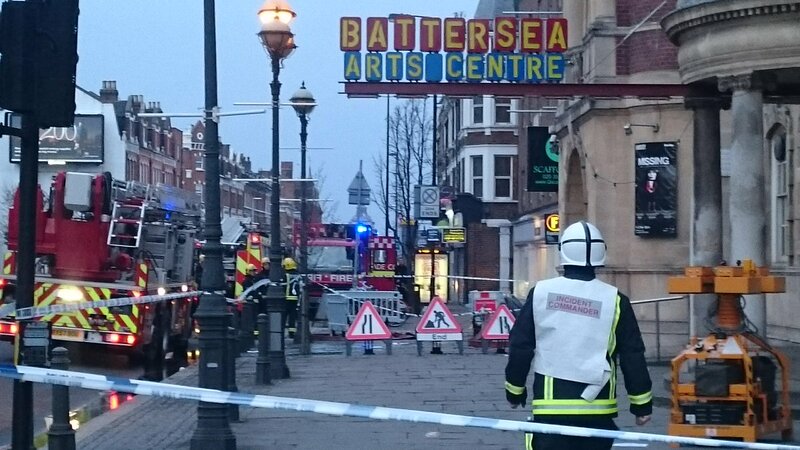 The Artistic Director of the Battersea Arts Centre has thanked the emergency services for saving the front half of the iconic building. The organisation and the front half of the building live to fight another day. We start now. Huge thanks are owed to all the emergency services, who literally saved the front half of the building, to staff, artists and volunteers at Battersea Arts Centre, and to everyone who has shown their overwhelming support online over the last 24 hours. The passion for the building and the organisation is extraordinary. Thank you all for being part of this. We really need you at this time. Today we start the next chapter. We want to get the shows back on and rebuild the building brick by brick. Huge thanks to the National Funding Scheme who set up a donate page on their site to raise funds. This is incredibly important. At the moment we have no offices, no Grand Hall theatre, and we have to re-establish a new financial model for the next 12 months. So your support - at whatever level - is so valuable. Thank you so much to everyone who has already donated and who has supported BAC through social media. Some performances scheduled for tonight at the Battersea Arts Centre are expected to go ahead. 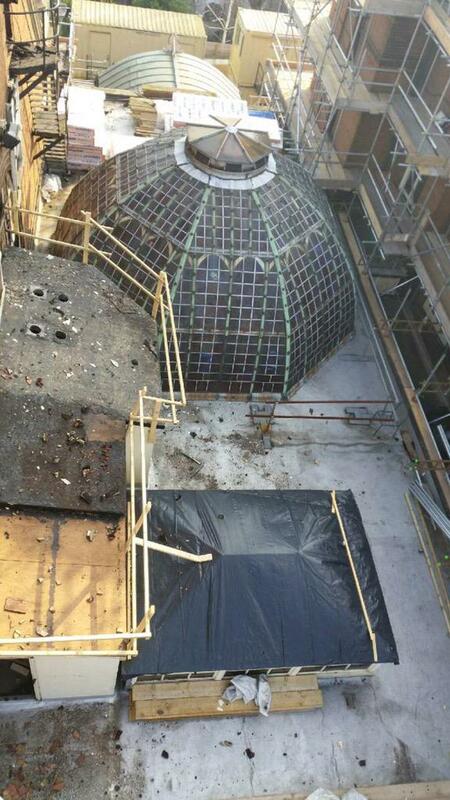 Despite the fire damaging parts of the building, some performance areas have been spared from damage. Fire fighters are expected to remain at the Battersea Arts Centre for at least a day or two to ensure the fire has been properly extinguished. Crews are currently damping down, as they contain small pockets of fire. Local Conservative MP Jane Ellison is talking to the Culture Secretary about the possibility of the government providing funding to repair the building. A fundraising page has also been set up to allow people to donate money for the repairs. 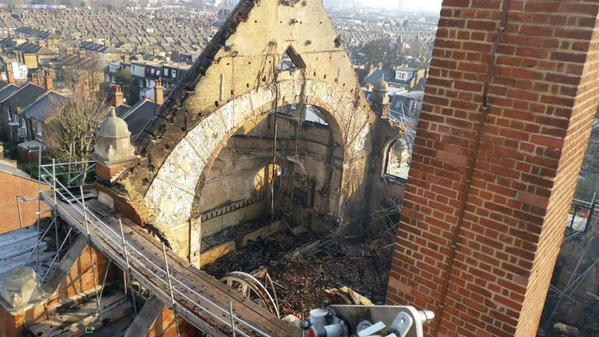 Fire crews remain at the scene of the Battersea Art Centre following yesterday's fire in the roof of the building. Investigators will try to determine the cause of the blaze, which saw more than a dozen fire engines and around 80 firefighters called to the building. Performances scheduled for last night and today were cancelled. The centre's director praised fire fighters for their efforts to save the building. "We are devastated by the speed and scale of this fire. The most important thing of course is that everyone got out of the building quickly and safely. Our heartfelt thanks go out to the brilliant fire brigade who limited the damage caused to the beautiful old town hall."